I mentioned that I wanted to experiment with lens flare for drama when I posted the quick fixes for common lighting problems yesterday. Here is my first no-planning-involved attempt, using the Square Enix Play Arts Kai Batman (who is totally awesome, if you actually need me to tell you that). I’ve intentionally set up one of my LED book lights in the shot, knowing that the bright light shining directly into my camera lens will cause lens flare artifacts. The light behind Bats is positioned such that it gives him that bright light on his profile and also appears as an element in the picture. Maybe it’s a GCPD chopper trying to get a bead on an escaping Bats. Maybe it’s a spot light in the gardens at Arkham. Drama! Because I also wanted to highlight that great triple Bat-grapple gun accessory, I set up the second LED to light only that. This is where having those flexible necks really comes in handy. I also chose to focus on the grapple gun, although my camera was set on aperture mode to reduce depth of field effects. 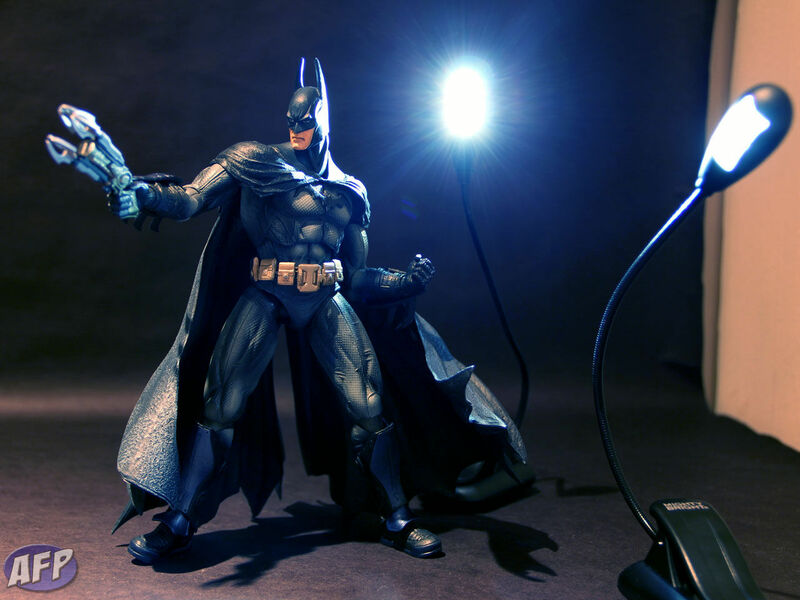 Finally, I used my DIY reflector to bounce some light back on the front of Batman. 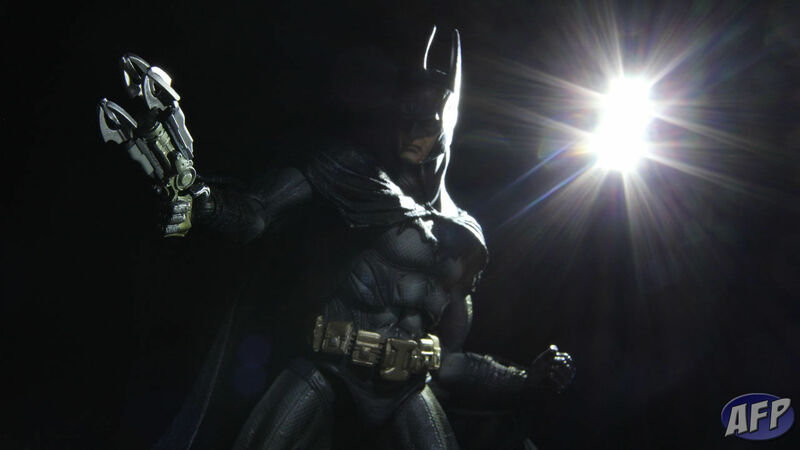 Otherwise, all you’d see in the shot would be the grapple gun and the lit-up portions of Bat’s left side. And, just a quick note, the only post work I did on the picture was cropping it to 16:9. That’s it – hope you enjoyed the picture!